In 1975, the Albuquerque City Council approved the creation of a Capital Improvements Program (CIP) to implement the City's adopted goals and objectives. 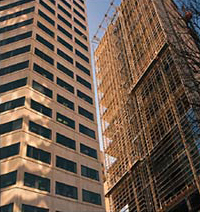 The scope of the capital program was broadened in 1996 and CIP was renamed the "Capital Implementation Program." As mandated by Section 2-12-1, et seq ROA 1995, CIP's mission is to enhance the physical and cultural development of the City by implementing the Albuquerque/ Bernalillo County Comprehensive Plan and other adopted plans and policies. Through a multi-year schedule of public physical improvements, CIP administers approved Capital Expenditures for systematically acquiring, constructing, replacing, upgrading and rehabilitating Albuquerque's built environment. In practice, this mandate means that CIP develops, and sometimes directly implements, diverse projects that enhance every aspect of the daily lives of all our citizens. Improvements to public safety include not only expansion of police, fire and emergency response systems, but also rehabilitation of aging infrastructure such as roads, drainage systems and the water and wastewater network. Additions and improvements to recreational spaces such as the zoo, libraries, museums, athletic facilities, parks and trails provide a rich palette of leisure activities to Albuquerque. Meal sites, and Senior, Community and Multiservice Centers serve young and old alike, meeting needs and improving lives. Funding for these programs is provided by a variety of financial mechanisms. Chief among them are General Obligation Bond Funds (G.O. Bonds.) By ordinance, 1% of G.O. Bond funds are earmarked for public art projects. Other major funding sources for capital improvements are: Enterprise Funds, primarily for the Aviation Department; and Quality of Life Funds, a special limited duration sales tax authorized in 1987 and discontinued in 1995 to enhance cultural and recreational opportunities and to improve targeted infrastructure. Other Sources of funding include: Metropolitan Redevelopment Funds; Urban Enhancement Trust Funds for citizen initiated cultural and capital projects; Federal and State grants. The Capital Implementation Plan also has responsibility for specific functions related to capital planning and improvements, including: design and/or construction of certain projects; design and development of City Parks; advisory responsibility for the selection of certain contracts; planning and implementation of Public Art projects; and development of special projects (e.g. Impact Fees), General Obligation Bond Funds, Enterprise Funds, Quality of Life Funds, Other Funding Sources.